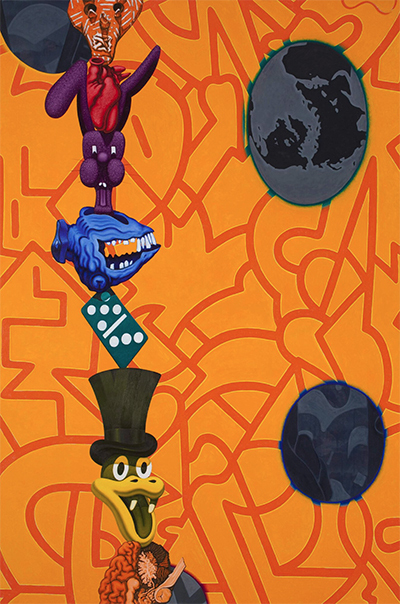 Benito Huerta, Exile off Main Street, 2012-18, oil on velvet, gems, tar and plywood, 63 x 99 inches. Benito Huerta, Casting Call, 1995 – 2012, oil on canvas, 78 x 53 inches. Courtesy the artist. The latest one-man show from Arlington painter/professor/curator Benito Huerta is dominated by self-portraits. He depicts himself as a skull with antlers, often in front of a massive nuclear explosion. Huerta used his own teeth as the model for each head’s pearly whites. But the ideas for the oil paintings, watercolors, and lithographs come from the many sources that have influenced him during his four decades on the Texas art scene, not the least of which was growing up in the Cold War era of “duck and cover” and rock ’n’ roll. Turning 66 years old in April, Huerta calls the exhibition at Fort Worth’s William Campbell Contemporary Art Odd Ducks and Other Assorted Tales, on view through April 18. At the heart of the show is Crown of Creation, named after the Jefferson Airplane’s psychedelic 1968 album featuring a similarly amber-colored mushroom cloud. 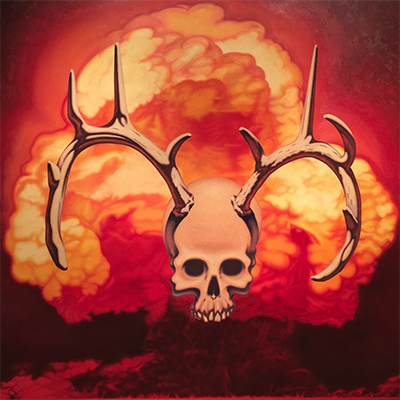 In Huerta’s 2016 oil-on-canvas, a huge skull-and-rack floats on top of the nuclear backdrop, inspired by Belgian artist James Ensor’s use of skeleton images as well as Frida Kahlo’s self-portraits in which her head is topped by horns, sometimes on a deer’s body. “There’s precedent for this,” Huerta says in his studio, a separate building next to the mid-century modern home he has owned since becoming an art professor at the University of Texas at Arlington in 1997. He is also director and curator of The Gallery at UTA and co-founded the magazine Art Lies. In 2002, the Dallas Center for Contemporary Art named him their Legend of the Year. He has had nearly 40 one-man shows, and is also represented by Kirk Hopper Fine Art in Dallas. Odd Ducks contains other skull-and-mushroom-cloud works, including the new painting Between Here and There, whose neon-orange color and patterned background suggest wallpaper. With its blossoming pastel flowers, another new piece, In Memory of Days Past, is almost more O’Keefe than an O’Keefe. Huerta planned to cover the middle of it with another skull even though, he says, his mother-in-law asked him not to. 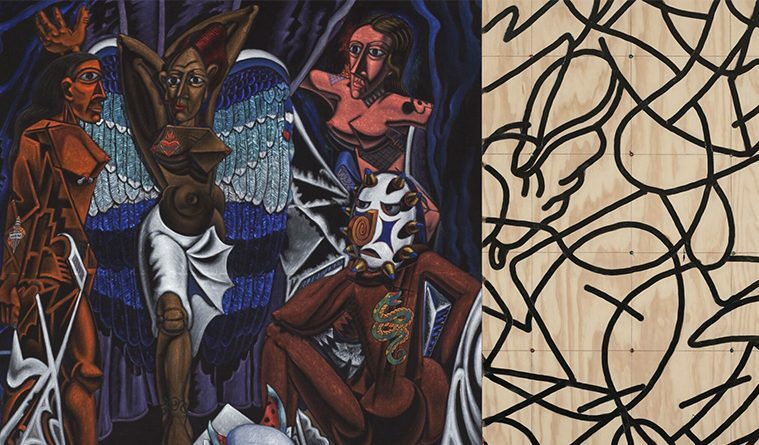 Skull imagery receives further treatment in the velvet painting Exile off Main Street, which refers to the Rolling Stones’ Exile on Main Street while playing off of Picasso’s Les Demoiselles d’Avignon and Huerta’s signature use of oddly intersecting lines he calls “flying chalupas.” This is how he operates, drawing on his influences all at once. 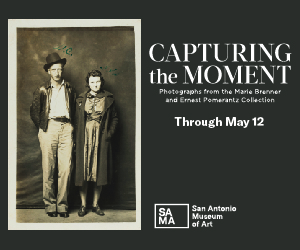 The exhibit includes a number of works, like Exile, Signature Painting, Signature Lithograph, and Mils Mascaras Redux, that reference his adaptation of south-of-the-border cuisine. Benito Huerta, Crown of Creation, 2016, oil on canvas, 84 x 84 inches. Courtesy the artist. Huerta has alluded to the nuclear threat in his art practice before, in such pieces as September Song and Shock and Awe, the latter superimposing a Gauguin-style woman on a mushroom cloud. He recalls seeing a book of photos that showed the shadows left behind by Japanese victims vaporized in the Hiroshima and Nagasaki blasts. Preparing in school for the possibility of a Soviet nuclear attack also made an impression on the young Benito, as did the politically minded rock music of the 1960s. The oldest of nine children and the first in his family to graduate from college, he came of age during the birth of mass popular culture. Born and raised in Corpus Christi, he remembers listening to a Wolfman Jack imitator on the radio. He was obsessed with the cartoon parodies in Mad magazine. Later, as a student at the University of Houston, he booked concerts, created posters for the shows and worked as a stagehand for some of the biggest acts of the day: Bob Dylan, George Carlin, Ringo Starr, Stevie Wonder and Carlos Santana, whose album, Abraxas, after which he later named an exhibition. “I thought about becoming a rock’n’ roll promoter,” Huerta says. 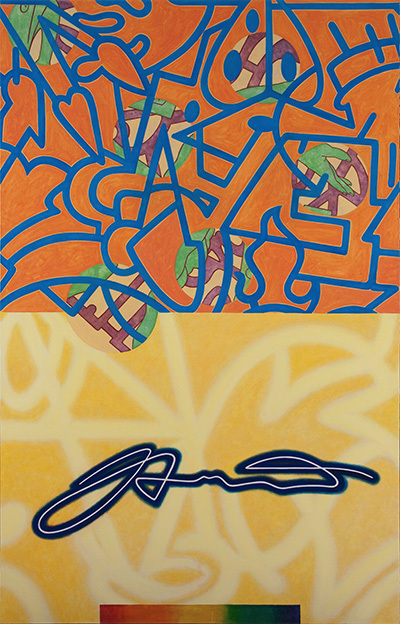 Benito Huerta, Signature Painting, 2002-15, oil on canvas, 77 x 49 inches. Courtesy the artist. For his exhibition at William Campbell, Huerta turned the lens on himself “cause it’s all about me,” he jokes. In a way, he’s right. Yet in these self-portraits, Huerta brings to bear not only the personal and political events that have touched his life but also many of the historical art movements that have influenced his now substantial body of work.